I have had my eye on the Everlane cocoon coat for a long time, and finally this year I made the leap and purchased it. It has quickly become one of my favorite pieces in my wardrobe. 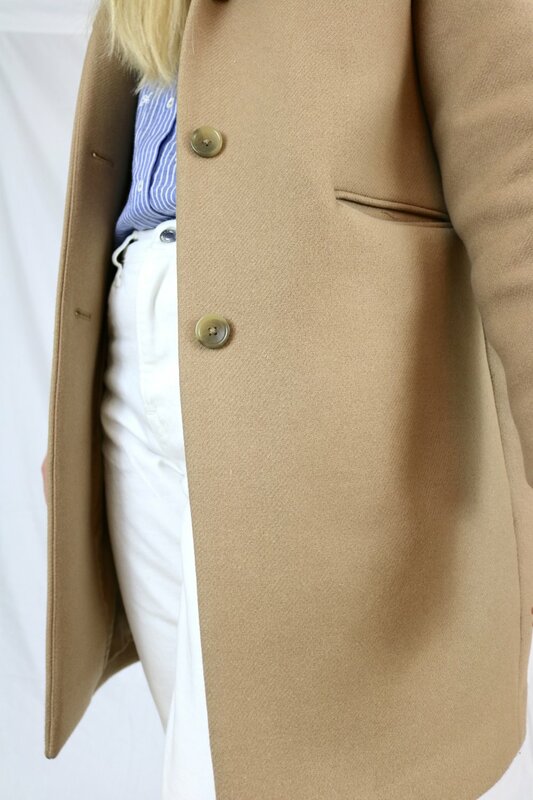 However, as it’s quite an investment, I thought I’d do a thorough review for those of you thinking about buying this coat. The Everlane cocoon coat is an oversized wool blend coat. It has an oversized, slouchy silhouette, and a thick, structured material. Lined in body & sleeves. Button up closure with large buttons. Features big, deep pockets you can fit a LOT of stuff in (I have stuffed a bunch of stuff in those things: my phone, wallet, keys, lipsticks…receipts…tissues…). Wool + synthetic blend. Lined with cupro/cotton & polyester. From the Everlane site: Shell: 60% Wool, 25% Nylon, 8% Polyester, 6% Acrylic, 1% Rayon; Body Lining: 55% Cupro, 45% Cotton; Sleeve Lining: 100% Polyester. Very oversized. It’s meant to fit oversized, but you still have to size down 1-2 times. I normally wear a 2 in Everlane, and I bought a 0 - and could have gone to a 00 for an even more fitted look. However, I liked the slouchiness of the 0. Plenty of room in the body & sleeves for layering with sweaters, etc. 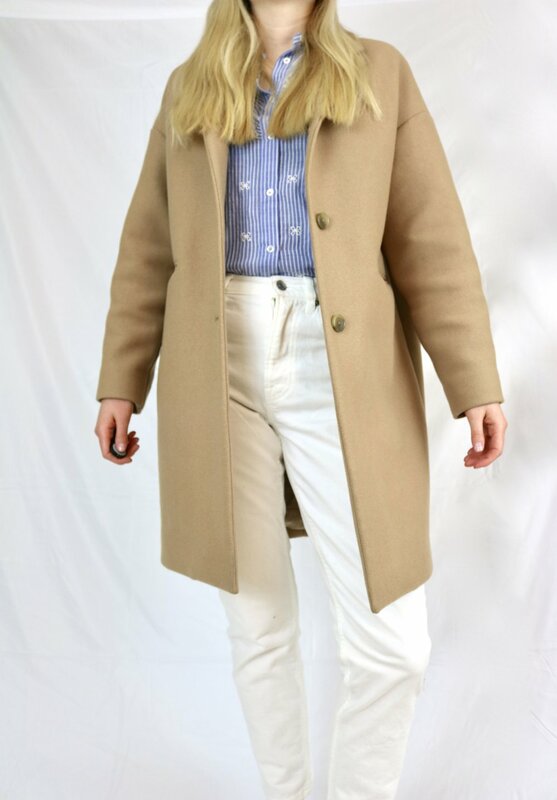 - perfect winter coat! It is not 100% wool, but the material is a wool blend, and is very thick and sturdy. To be honest, after wearing this coat even once, I had little regrets about the paying the $250. I would really prefer that it be a higher percentage of wool for the money, as I don’t have a great love of synthetic fibers, and I’d be curious how Everlane is going to deal with this in the future with their new Renew initiative (getting rid of virgin plastic in their production line). Perhaps they will switch it to natural fibers, or recycled nylon? I went for the camel, just because I think it is classic & timeless, and it did NOT disappoint. The color goes with everything, and is even more beautiful in person. Also come in other colors! Also wearing: Everlane cheeky straight in bone wash, Sezane Leo shirt, thrifted block heels. Love, love, love! However, sizing can be tricky, depending on the fit you want: size down 1-2x. Sizing down once will still have a slouchy fit, and sizing down twice will make it more fitted. Color is beautiful, material is thick & sturdy, and the pockets are just fantastic. Wish the price point was a little more accessible, however, I anticipate that I will be wearing this for years to come, and that I will definitely get a great price per wear in the end. Some drawbacks include the synthetic content to the material. An alternative to this coat that is 100% wool and has a recycled polyester lining is the Amour Vert wool coat. Interestingly enough, this coat is also less expensive at $198 compared to Everlane’s $250. Another drawback is the button closure, which is both a pro and a con. Pro: it looks chic & classic. Con: the buttoning can be stiff, and it makes me fearful that I might snap one off if I’m not careful in the future. In the end, this became my favorite piece of my winter wardrobe. I threw out all my other winter coats because this piece was so versatile (except one puffer jacket I could wear to work and wouldn’t be afraid of leaving around in unlocked places). It is beautiful, versatile, and extremely warm.